Spending limits on political campaigns and caps on individual donations remain "obstacles" to a deal on party funding, Sir Hayden Phillips has said. His year-long review recommends both be capped, but despite "broad agreement" the parties can not agree on details. However Sir Hayden believes a deal is "within reach" and is now to chair face-to-face talks between the parties. The review, which also backs a £25m a year rise in state funding, is designed to "restore public confidence". Sir Hayden's inquiry was commissioned by Tony Blair in March 2006 after it emerged that to fund their 2005 General Election campaign, Labour was secretly loaned nearly £14m and the Conservatives £16m. The Liberal Democrats said they borrowed £850,000 from three backers. His recommendations also include the largest parties cutting spending between elections by £20m each. The prime minister welcomed Sir Hayden's report, saying "it shows very clearly that there is now the basis for a new agreement on the funding and expenditure of political parties". He said he hoped consensus could be reached in talks between the three main parties before the summer recess in mid-July. Mr Blair said a deal would pave the way for legislation in the next parliamentary session. 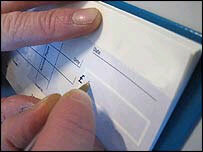 Labour chairman Hazel Blears said the practical implications of capping donations would need to be studied. "What he says, is that different political parties have got different historical structures, he wants to be able to recognise that ...he recognised that the three and a half million trade union members, ordinary working people who pay just a few pounds a year in terms of their political fund, are in a different position than massively big donors. "So, we will have to think carefully about this and its affect on the party." Conservative Party chairman Francis Maude said the party accepted the report's main recommendations. "We believe that all political parties should work together to achieve this," he said. Liberal Democrat parliamentary spokesman David Heath said the key objective must be to restore public confidence in the political system. "There are undoubtedly difficult areas for all of us to consider," he said. In his 25-page report, Sir Hayden said a £50,000 limit on donations from individuals or organisations - as demanded by the Conservatives - would be "reasonable and attainable". But he said this would create considerable difficulties for Labour if this meant it could no longer get considerable funding from trade unions. One option would be to treat union donations as being made up of many individual gifts from members, he says. This would only be acceptable if union members signed forms confirming they want their contribution to the union's political fund to support a particular party. If there were to be an agreement, a cap on donations would lead to a fall in income so Sir Hayden recommends an increase in state funding. He said state funding should be linked to backing among the public - proposing that eligible parties receive 50p each year for every vote cast for them in the most recent General Election and 25p for every vote in the most recent ballots for the Scottish Parliament, Welsh Assembly and European Parliament. An alternative would be to use an internet-based subscription system where people's donations of £5 could be matched by state funding. But Sir Hayden acknowledged the difficulties which remain saying: "Achieving this will require tough decisions on all sides, particularly about donation limits and spending limits." Other recommendations include new measures to prevent the breach of regulations on donations, strengthened controls on expenditure by third parties, public access to better, clearer information about the sources of party income and new powers for the Electoral Commission watchdog to oversee the new system. The chairman of the Electoral Commission, Sam Younger, said he agreed with Sir Hayden's analysis that a new approach to funding was necessary. "We are clear about the need for the Electoral Commission, as the regulator, to be as effective as possible. "We are already reinforcing this, and will be ready to implement whatever changes are agreed following the discussion which we, like Sir Hayden, hope will take place quickly following today's report."